Are you a council tenant? Then you must be punished. Will rent rises for higher earners discourage work? Housing: Who are the real 'underoccupiers'? Where will the Council re-house us? Is council housing the answer to our problems? Should social housing tenures be for life? Would tenancy plans leave no room for improvement? What is the future of social housing? 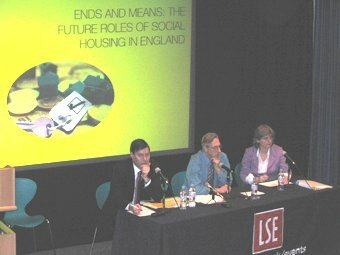 Professor John Hills published his Ends & Means report on the ‘Role of Social Housing’ on Feb 20 2007. (Download Hills and Cave Issues DCH Factsheet). It is clear that someone – we presume Ruth Kelly’s Department for Communities – is briefing that Hills has endorsed an attack on the fundamental principles of council housing. It is obvious that Ministers are increasingly desperate – losing the Brighton ballot (another 77% NO vote announced today) increases the pressure on them to listen to the people and agree the ‘Fourth Option’ but they are still intent on trying to find a way of getting rid of council housing. Hill’s position is less clear. "if you came with the impression that I was going to be recommending the ending of security of tenure, or that tenants if they're lucky enough to improve their circumstances will be thrown out of their homes, then you're going to be disappointed. "… "security and stability are a fundamental part of their lives"
Tenants packed a room at Parliament after the Hills report launch to launch the new DCH pamphlet 'Dear Gordon' Invest in decent, affordable, secure and accountable council housing which challenges Gordon Brown to change government policy. MPs attending included Michael Meacher, Frank Dobson, Ken Purchase, Jon Cruddas, Paul Holmes, George Galloway, Kelvin Hopkins, Brian Iddon, Alan Simpson, Harriet Harman, Mike Gapes, John Hemming and Brian Binley. Trade union leaders Gail Cartmail (Amicus), Jack Dromey (T&G), Iain McNicol (GMB) and Wilf Flinn (UCATT) spoke alongside Professor Peter Ambrose and tenants from local campaigns. The Hills report does open a door – he talks about ‘offering’ people who approach the council in housing need and existing tenants ‘alternatives’. Ruth Kelly has pounced on an opportunity. In government language ‘offer’ means force or coerce so she’s trying to fly some kites to whether people (council tenants and MPs) will stomach proposals on means testing the right to a council home; differential rents and/or time limited tenancy agreements. Any attempt to restrict the ‘right to rent’ decent, affordable, secure council housing from an accountable landlord will face massive opposition. It also makes a mockery of the government’s stated aim of creating ‘sustainable communities’. Restricting access to council housing to only the poorest creates distorted and transient communities and denies council tenants the right to a ‘home’ as opposed to somewhere just to temporarily lay our heads down for the night. Kelly said yesterday this was a start of the debate. One day is quite long enough! Nearly 3 million council tenants across the UK and the 1.6 million households on council housing waiting lists will fight any attempt to reduce our security of tenure and we’re demanding government stop robbing council housing and agree the ‘Fourth Option’ to improve existing and build new council homes. Professor Hills identified a number of problems with council housing in this report. Contributing to the debate at the LSE Alan Walter, chair of Defend Council Housing, suggested to him that tenant dissatisfaction on repairs could be largely solved if government fully funded council expenditure on management and maintenance (M&M) and dissatisfaction on overcrowding would be solved if more council homes were built. To loud applause Alan Walter invited John Hills to join with tenants and other supporters of council housing in urging the Secretary of State to fund the ‘Fourth Option’ as her own party conference has voted three years running. Hills kept to his script replying it wasn’t up to him to comment on whether there should be a “first, second, third or fourth option” – that was up to Ministers. The alliance of council tenants, national trade unions, councillors and MPs across parties is waiting. DCH also met with the Cave Review team at the Department for Communities (DCLG) on Monday to give oral evidence in support of our written submissions and to clarify the aims of the Cave Review into Housing Regulation. We will be discussing how to bring tenants together from around the country to make sure our voice is clearly heard. Tuesday afternoon (Feb 20 2007) Professor John Hills is due to report on the ‘Role of Social Housing’ for Secretary of State Ruth Kelly. In the evening Defend Council Housing is launching a new pamphlet ‘Dear Gordon: Invest in decent, affordable, secure and accountable council housing’ at Parliament (6pm Boothroyd Room, Portcullis House, Westminster). We’re hopeful that Hills will come to the right conclusions. There are high expectations amongst nearly 3 million council tenants and more than 1.6 million households on council housing waiting lists that this government will finally commit to investing in improving existing and building new council homes to address housing need. The standard of house design is getting worse as the private sector dominates, according to Council for the Built Environment. Most homes failing the government’s Decent Homes standard are in the private sector. Home owners may be ‘asset rich’ but many are too ‘cash poor’ to maintain their homes. Many owners (including the elderly and disabled) find the responsibility and organisational demands too much. Rents in the private sector are very much higher than council rents (landlords expect a profit from their investment). RSL rents and service charges are significantly higher too. Mortgages on the smallest property are beyond the reach of most. Private tenants on short-term tenancies are at the mercy of their landlords. Eviction rates amongst RSL tenants are higher too. Repossessions have risen by 65% last year and the courts are taking on more judges to deal with cases before them. The council ‘secure’ tenancy is the strongest protection available. Council tenants uniquely elect our landlords. Several local authorities have changed political control after council tenants exercising their power at the ballot box. Many council tenants are members of Tenants & Residents Associations which take up individual grievances and work closely with ward councillors and senior housing managers. John Hills should recommend an increasing role for council housing and an end to government discrimination against it. It is wrong that government has systematically been siphoning money out of council housing. Ring fencing all the income from tenants’ rents and receipts from ‘right to buy’ and other sales along with a ‘level playing field’ on debt write off and gap funding would fund the ‘Fourth Option’ of direct investment that tenants, the Labour Party conference and a broad alliance of councillors, MPs and trade unions demand. The hype over home ownership is overplayed. Shelter’s research showed that 72% put ‘affordability’ and a safe neighbourhood above ‘ownership’ in their list of priorities. Most so-called ‘affordable’ housing is not affordable for the vast majority. Public subsidies of £47,000 for key worker shared ownership schemes are expensive and many schemes are undersubscribed because the homes are still beyond reach. Many prefer to rent - particularly if they can get first class housing that they can actually afford, is secure and has a landlord they can hold to account for management, maintenance and other responsibilities. The government cannot claim to support ‘choice in public services’ and then deny council tenants the right to choose to remain with the council and have their homes and estates improved. The government cannot create ‘sustainable communities’ if they force tenants to move on and out against their will by imposing a time limit or introducing a means test on their tenancy. It would turn our estates into massive hostels with a transient, not sustainable, community!